Any cancellation received within 5 days prior to arrival date will incur the full period charge. Failure to arrive at your hotel or property will be treated as a No-Show and no refund will be given (Property policy). This property is 1 minute walk from the beach. 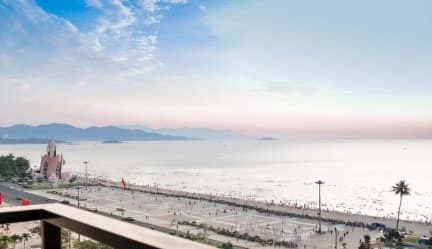 Located in the prime location within Nha Trang City, Pavillon Garden Hotel Nha Trang is just a 3-minute stroll from Nha Trang Beach and 2/4 Square. Guests can go for a swim by the outdoor pool. The hotel also offers complimentary WiFi access to all in-house guests. The Night Market is about 3 minutes away on foot, while both Sailing Center Vietnam and Sailing Club are 100 m away. The hotel is only 300 m from Tram Huong Tower. Nha Trang Airport is 17 mi away. With many sea-view rooms that open to a private balcony, the property provides rooms that are equipped with a cable TV, air conditioning and a comfortable seating area. Bathroom facilities are en suite. Some rooms offer views of the surrounding city. Warm and friendly staff at the 24-hour front desk can assist you with luggage storage and travel arrangements including bicycle rentals and airport transfers.